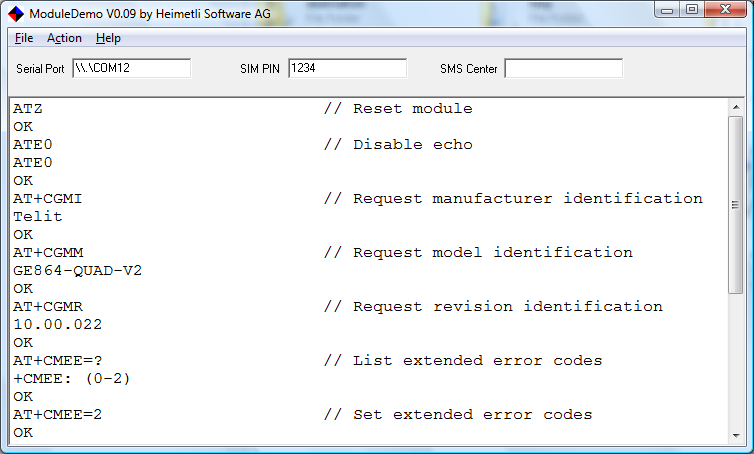 The initialization demonstrates all the necessary AT commands to reset the module, turn off the echo, set the PIN code, set the SMSC number, set the text mode for SMS messages, turn on the notification messages and the modules responses to these commands. The whole session will be logged and the log can be saved to the disk. Once initialized, you can send SMS messages, list all the messages in the preferred store, list the unread messages and delete the messages from the store. THIS SOFTWARE IS PROVIDED WITHOUT WARRANTIES OF ANY KIND. THE AUTHOR CAN'T BE MADE LIABLE FOR DAMAGES WHICH ARE CAUSED BY USING THIS SOFTWARE. If you have problems, questions or suggestions about ModuleDemo, or if you find it useful, don't hesitate to send us an email.